Specifically, the expansion increases the Hood’s exhibition space by 42% to 16,350 s/f, adds three classrooms with the latest object-study technology—tripling the number of student classroom visits the museum can host—and increases the total number of galleries from 10 to 16, with the addition of six new galleries. The expansion also increases the Hood’s overall square footage by more than 50%, to 62,400 s/f. The project budget for the renovation and expansion is $50 million, which has been raised through private donations. The new Hood Museum of Art comprises two floors of public exhibition spaces and study galleries, a third floor for administrative offices, and a lower level for object storage and exhibition preparation. The off-white brick façade of the new building was selected by Tod Williams and Billie Tsien to be in complementary conversation with the existing structures along the Green, and with the adjacent buildings on either side of the Hood: the traditional redbrick Wilson Hall and modernist Hopkins Center. The Hood closed for the expansion project in March 2016, and groundbreaking took place in July 2017. The new Hood features a prominent entrance that opens directly onto the Dartmouth Green, which is the heart of the campus. Visitors will cross the Hood Plaza and enter the sweeping lobby—the Russo Atrium—which serves as a crossroads where students, faculty, and campus visitors can congregate. It will be a flexible venue for events such as student meetings, dinners, or performances, and will feature commissioned works of contemporary art. The Atrium will provide a new public concourse from the center of campus to Dartmouth’s arts district, which includes the Hood, the Hopkins Center for the Arts, and the Black Family Visual Arts Center. On the ground floor of the Hood is the Bernstein Center for Object Study, composed of three new study galleries, accessible from the Atrium. The study galleries create unparalleled opportunities for engagement and research within a museum setting and address an increased curricular demand for direct experiences with original works of art. Technology is integral to the design of these study spaces, enabling faculty to better contextualize objects through the use of film, the internet, the Hood’s comprehensive database of its collections, and other forms of new media. Classes from disciplines as diverse as anthropology, biology, and engineeringwill take place in the museum, engaging more than 40 departments and interdisciplinary programs and all four of Dartmouth’s graduate schools (the Frank J. Guarini School of Graduate and Advanced Studies, Geisel School of Medicine, Thayer School of Engineering, and Tuck School of Business). In addition, the Hood has long specialized in student engagement and the museum takes this tradition to a new level by combining two well-established programs to present a student-curated exhibition comprising artworks that were acquired by students. For over 15 years, the museum has offered an annual class called “Museum Collecting 101.” The class culminates with a trip to New York galleries, where students select works for the museum’s collection. For the new Hood, student interns, working in the context of the Hood’s curatorial program A Space for Dialogue, have organized an exhibition that features exclusively student-selected works from the collection. Their chosen curatorial theme, “consent,” is apt for the medium, the campus, and the world today. Titled Consent: Complicating Agency in Photography, the exhibition asks questions about consent in photography and is organized into four sections: Self-Reflection, Individuals and Identities, Public Spheres, and Global Ethics. The museum’s curators have taken full advantage of the increased gallery space to present a greatly expanded selection of art from around the world and throughout time. The new museum includes guest-curated exhibitions of Native American art, African art, contemporary Aboriginal Australian art, and the art of Papua New Guinea. In addition, highlights of the Hood’s collection of European Old Masters, American art, and antiquities are all on view. Recent acquisitions on view include large-scale paintings by Eddy Kamuanga Ilunga (L’attitude face à la mondialisation [Attitudes towards Globalization], 2015), May Stevens (Big Daddy Paper Doll, 1968), and Alma Thomas (Wind Dancing with Spring Flowers, 1969); as well as a sculpture by Jeffrey Gibson (WHAT DO YOU WANT? WHEN DO YOU WANT IT?,2016), and 19th-century works by Thomas Cole (View on Lake George, 1826) and Cecilia Beaux (Maud DuPuy Darwin, 1889). A new acquisition by Julie Mehretu (Iridium over Aleppo, 2012–2018), is also on view. Additional highlights from the collection which are on view include a large-scale work by El Anatsui (Hovor, 2003); sculptures by Yayoi Kusama (Accumulation II, 1962), and Bob Haozous (Apache Pull-Toy, 1988); a Pablo Picasso painting (Guitar on a Table, 1912); and historic works including a Solongo style sculpture (Nkisi Nkondi, Power Figure, 19th century) and gypsum reliefs from the reign of Ashurnasirpal II (including The King and Genie: Relief from the Northwest Palace of Ashurnasirpal II at Nimrud, 883–859 BCE). Visitors can access the second-floor galleries two ways: either via the new staircase in the entrance gallery or via the restored, signature Charles Moore stairwell in the original building, which bridges the historic building and the TWBTA expansion. The Moore stairwell continues to bring light into the galleries, while offering visitors a striking perspective of the Atrium below. In addition to the five galleries on the first floor, there are 11 galleries on the second. Highlights include the Harteveldt Family Gallery and the double-height northeast gallery with ceilings to accommodate tall sculptures or complex installations. The Engles Gallery, facing the Green, features a 14 s/f plate-glass vitrine window on the Hood’s front façade—a signature architectural element that will allow art to be visible from the campus Green. The window will be illuminated at night, like a light box for art when viewed from the exterior. The Hood’s expansion encompasses improvements to and restoration of the 10 original Charles Moore galleries, retaining their historic design elements. New offices for museum staff were moved to the third floor, freeing gallery space on the first level. 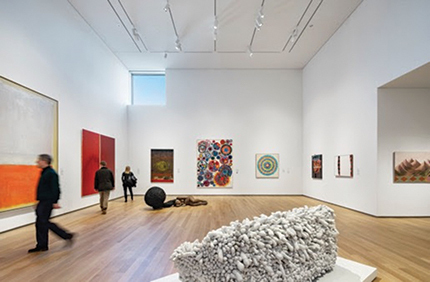 The six new galleries allow the Hood to display portions of its collections that have not been exhibited on a regular basis, including contemporary Aboriginal Australian art, Native American art, and signature modern works by such artists as Ed Ruscha, Mark Rothko, Alma Thomas, and Pat Steir.